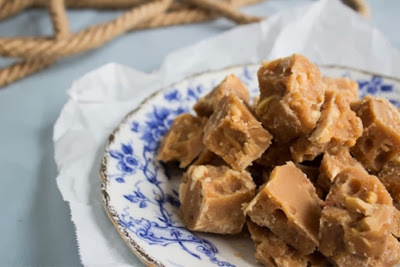 My Home and Garden: Brown Sugar Fudge....so Ontario. I was born in Ontario and my Dad used to make this fudge when I was little. This picture brings back such memories. I haven't made it yet, but I will ! 3/4 cup peanuts, salted or unsalted (optional) **they say optional, but they don't mean it. Go salted. 5. Pour the mixture into the prepared loaf pan, smoothing the top with a spatula. Let cool completely before cutting into squares. They will be a bit crumbly, so don’t worry. Serve immediately or store in an airtight container for up to two weeks. ***Recipe adapted from Redpath Sugar's recipe. This sounds amazing!! I bet with salted peanuts it's just delicious. I love the sweet-salty combo. I do too Staci. It all started with a sample of Purdy's Himalayan salted Caramels. OMG!! !